India voted to create a 29th state with important political and demographic consequences. Geography syllabuses are in for a change in India. Students have been learning that there are four Dravidian states in South India but now they will have to memorize a fifth. With the creation of Telangana, the biggest democracy in South Asia has added one more state, thereby taking the total to 29 Indian states. With the Upper House passing the bill to create a new state by bifurcating Andhra Pradesh on Thursday evening, Telangana became a reality. For almost two weeks, parliament witnessed unprecedented chaos and acrimony over the passage of the bill. Those protesting the bifurcation of the state resorted to all sorts of tactics, including using pepper spray, to disrupt the proceedings and delay the inevitable. But this was not to be. With the ruling Congress and the opposition Bharatiya Janata Party (BJP) both in favor, there was no doubt in anybody’s mind that the winter session of parliament would give birth to a new state, which it did on Thursday. The delivery of the new state came after a long labor of over four decades. Hundreds of lives were lost in the process. The first major struggle to carve out a new state started in the late 1960s but the Congress government in Delhi crushed the movement. The Telangana movement did not die down. 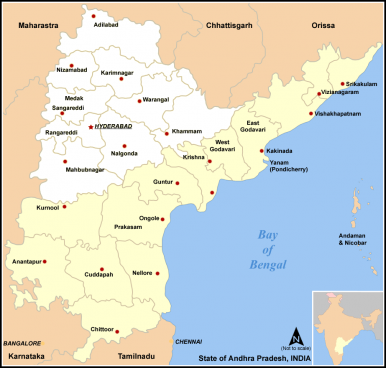 The seeds of dissension in Telangana were planted in 1956, when Indian states were reorganized along linguistic lines and South India was divided into four separate linguistic states–Telugu speakers got Andhra Pradesh, Tamils Tamil Nadu, Malayali speakers Kerala and Kannada speakers Karnataka. But the people of northern Andhra Pradesh, despite being Telugu speakers, were not happy with the division. They feel culturally, historically, and economically separate from the the other part of the state. History says that the Telangana region–that is, northern Andhra Pradesh–was under the rule the princely state of Nizam. They were not part of British India and as a result modern education and other economic benefits which linguistically contiguous areas witnessed did not reach the princely state. After Independence, when the princely state was merged with greater India, the linguistic similarities did not hide the cultural and economic differences and disparities. Successive Chief Ministers of Andhra Pradesh since 1956 failed to develop the laggard region of the state. The people of Telangana felt exploited and deprived in their own region. These historical grievances have been the driving force behind the demand for a separate state. One wonders why the ruling party decided to take the plunge today, after so many years. No doubt the backwardness of Telangana is the main factor for its creation, but the immediate cause is political. The predominant political force in the state, the Congress Party, has started losing its clout after the accidental death of its powerful Chief Minister Y. S. Rajasekhara Reddy in 2009. A rebellion by the departed leader’s son divided the party and subsequent Chief Ministers failed to exercise a firm grip on the state. Andhra Pradesh has been one of the prime states which has been instrumental in the successive victories of the Congress Party in Delhi. The party won three out of four parliamentary seats in the state in 2004 and 2009 and consolidated its power in the national capital. Then, divisions in the party and a lack of any powerful leadership within the state began to gnaw away at the ruling alliance in Delhi. By acquiescing to the long-pending demand for a separate state, the party is attempting to stay afloat in a region where it was otherwise facing a complete washout. With the creation of the Telangana Congress Party, the Congress now hopes to garner a majority of 17 parliamentary seats in the new state. The BJP also senses power in the new territory. It has started wavering on its stand under the influence of its potential regional partner, the Telugu Desam Party (TDP), whose support the Hindu right-wing party sees as important in aiding the formation of a government in New Delhi after the 2014 elections. The right-wing party also calculates that in other regions of Andhra Pradesh, the BJP does not have any chance to establish itself, but in Telangana, because of its predominant Hindu demography, it has a chance to gain its foothold in the future. Political calculations apart, with the birth of a new state, what used to be Andhra Pradesh is now divided into two regions: Seemandhra and Telangana. For ten years, both states will share Hyderabad as a joint capital. The Prime Minister announced a financial package for Seemandhra to compensate for the loss of a huge swath of territory. The debate in Andhra Pradesh is settled, but in the future, voices for separate states will gain currency in other parts of the country. A Nepali-dominated region of West Bengal has been pushing for a separate Gorkhaland for more than two decades. The creation of Telangana will give a new sense of urgency to the demand. The Western Indian state of Maharashtra faces a clamor for a Vidarbha state and it will get louder in the years to come. The largest state, Uttar Pradesh, has been beset with voices calling for three separate provinces. The arrival of Telangana will strengthen such voices.